Have you ever read something and asked yourself, "Well, what the heck does THAT mean?" The words are confusing. The text doesn't seem to make sense...something like that. I use the two pictures above to illustrate my point about something written that can at first appear a bit odd, shall we say. 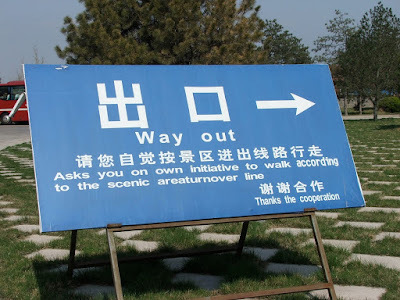 I took those two shots on a trip to China with my school a few years ago. The first is from the Terracotta Warriors museum outside Xian. 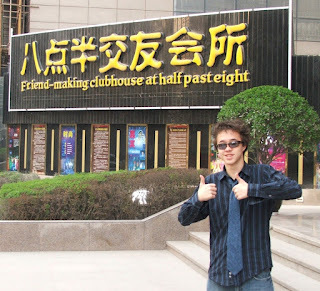 The second shot is from outside our hotel in Shanghai, with the ever awesome "Cash-Money" Andy giving the thumbs up. "Friend-making clubhouse at half past eight." I mean, why can't it be half past seven, or quarter to nine? SO, where does the meaning of something come from? We live in a Post-Modern world, in which almost everything is relative. People will argue that there is no final say to anything. It is what you want it to be, and that is good enough. I would like to posit an argument against that. In fact, I would like to take a look at the three different ways that that people will argue over how something comes to mean ANYTHING. I make this argument in particular because it has to do with how people read the Bible. I think that a huge amount of the nonsense that some people say, could be done away with if they would read Scripture properly. My weapon of choice will be E.D. Hirsch, the brilliant, and now retired, former professor from the University of Virginia. http://en.wikipedia.org/wiki/E._D._Hirsch,_Jr. When I attended Bethel Seminary, our first semester was used to cram, beat & stuff us with his book "Validity in Interpretation." I don't say that in a bad way, because I thought that he was spot on with his argument. I'll break it down into three basic points. Then, you tell me if he is right or wrong. Case in point from Ephesians 5:18. "Do not get drunk on wine, which leads to debauchery. Instead, be filled with the Spirit." Now, according to this first view, Paul is strictly talking about getting drunk on wine. So, since he says nothing about beer, let's bust out a keg of Liennies and party down until we all pass out. You would most likely say something along the lines of "PUH-lease! That is not what Paul is getting on about." You would be correct...unless you are a lawyer. But if you think this argument doesn't hold water for some, I invite you to take a trip to the country of Azerbaijan. It is an Islamic country, but also a former member of the Russian empire. Now, the Koran strictly forbids the drinking of wine...but it says nothing about vodka. So, many Azeri's use this interpretation to justify their consumption of alcohol. Meaning #2: Meaning is relative, and can be what ever you interpret it to be. This one is perfect for our post modern age. Someone can ask you what the song "Baby got Back!" means to you, and you can say, "Well, to me it is about my girlfriend returning home after a long day of shopping," instead of the rapper's meaning of the song...in that he enjoys large behinds. Charles Manson certainly embraced this view when he believed that the Beatle's song "Helter Skelter" told him that he was supposed to start a Race War. You can see the obvious problem. I once worked with a fellow who was quite the Pot-Head. He told me that he was only doping up because it was God's desire that he do so. He pointed out that in the first creation story in Genesis 1, God made all of the plants and God saw that it was good. And that is why he chose to is why he doped up. It was God's desire after all. Let's say you write your sweetie a nice love poem. In it you describe her as a red rose. Her response is the following; "You mean to tell me that you think I smell, am a thorny person, and that I attract aphids?!?!?!?!" To which you would most likely respond, "But Angel Dimples, that's not what I MEANT!" Ta da, and there is your answer. Meaning #3: Meaning comes from what the author INTENDS for it to say. This is where E.D. Hirsch comes down, and I completely agree with him. When I write a letter to someone, I am the one putting all of the thought and effort into it. You can't take my words and get them to fit some other way. It can only & ever mean EXACTLY what I want it to mean. Most people would simply say, "DUH, that's just common sense!" Yeah, well, common sense is not so common. I bring all of this up because I am constantly worried about how so many people take passages from the Bible and twist them to fit their pre-conceived ideas. You will only be able to understand the Bible when you look at it from the various writer's points of views & perspectives. You will only figure this out when you try to find the CONTEXT of any given portion of the Bible. Context is the over-all perspective of a work. What was the situation culturally & historically when this piece was written? Who was the author writing it to and for? What is the big picture, etc? With out attempting to understand that, you are most likely to miss the point of anything that you read in the Bible. It's not that everyone out there has to be fluent in Greek, Hebrew, Aramaic, etc...or that you need a Masters in Biblical History. No one ever gets it %100. But anyone would be wise to do their homework before assuming that they have it all figured out. Christopher Walken is one of the most recognizable actors in the world...and one of the most imitated. My favorite scene of his acting ability comes from True Romance, where he and Dennis Hopper spar off while being informed where Sicilians come from. (I won't play that clip, cause it is pretty strong.) Here is his famous scene from Pulp Fiction. He is only in the movie for a few minutes, but he steals the show. NOW, both of these people have their place in the grand scheme of things. Walken does his acting stuff. Gaga does her Hoochie stuff. However, combine the two together and you get THIS! Pretty bloody funny, don't you think? (I've been waiting to use this bit.) The reason that it is so funny, though, is because both of these people and their work are being taken out of context. Heck, it's funny...but it is hardly accurate. You see my point? Keep it in context folks, keep it in context. I love this one! Specifically your paragraph on "context".